I tested out a paper-making kit with my husband's mom last week. We tore up old drawing paper and newspapers. Then we blended them into a pulp. After pouring our concoction onto a screen, we added flowers, leaves, seeds and sometimes, glitter and bits of yarn. Some lessons were learned. Dried flowers work best. Glitter is dangerous so use sparingly. And don't overdo the pulp unless you want to the paper to dry next year. This paper certainly wasn't made for writing. I cut them up this week to be bookmark size. I placed fancy stickers on a few and threaded yarn on almost all. I don't have 20 books to read at once so most of the marks are going to some unsuspecting friends. But I do have two new loom-knitting books for two of my flowery bookmarks. 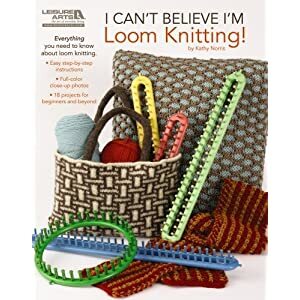 I'm looking forward to making the Lattice Pillow and Felted Basketweave Tote right there on the cover of I Can't Believe I'm Loom Knitting . Almost every project by Kathy Norris introduces a new stitch or technique I've never tried. 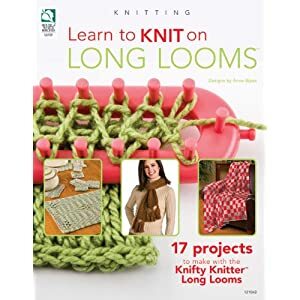 I also picked up Learn to Knit on Long Looms by Anne Bipes. The placemat set pattern intrigued me with its simple lace pattern. And the beaded mitten-scarf-hat set is so pretty! This book might get me to use my long looms a bit more. Are the papers too rough to try using media art tools on it like pastels or paints? Thank you! I'm honestly quite new to paper making. 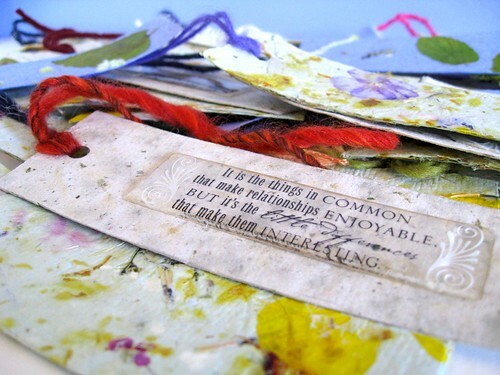 But I would think the paper would be durable and smooth enough for art media if the flowers are left out of the screen. Those bookmarks are great! I love the green aspects of them (recycling plus adding gifts from nature).